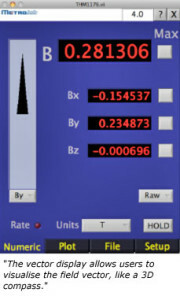 Visualising the spectrum of a time-varying magnetic field on your handheld, identifying each of its components, displaying the field vector... After a year of development, Metrolab is proud to announce the updated THM1176: the world’s only handheld 3-axis Hall magnetometerAn instrument to measure magnetic flux density (B) or magnetic field intensity (H).... is now a precisionPrecision is how closely multiple measurements will be clustered. Also called reproducibility or repeatability. In everyday speech, often confused with... spectrometer! How do we analyse the magnetic fringe field generated by an electric motor? What exactly are the amplitude and frequency of the main peak? Does surrounding equipment produce noise at 50 Hz? And at 30 Hz? The answer to these crucial questions – and many others! – can now be obtained in just a few seconds, at least if you happen to own Metrolab’s THM1176 Hall teslameter. "We have invested a huge amount in 2011 to further develop the product", explains Philip Keller, Metrolab’s marketing and product manager. "It is now the first Hall teslameterSee magnetometer. 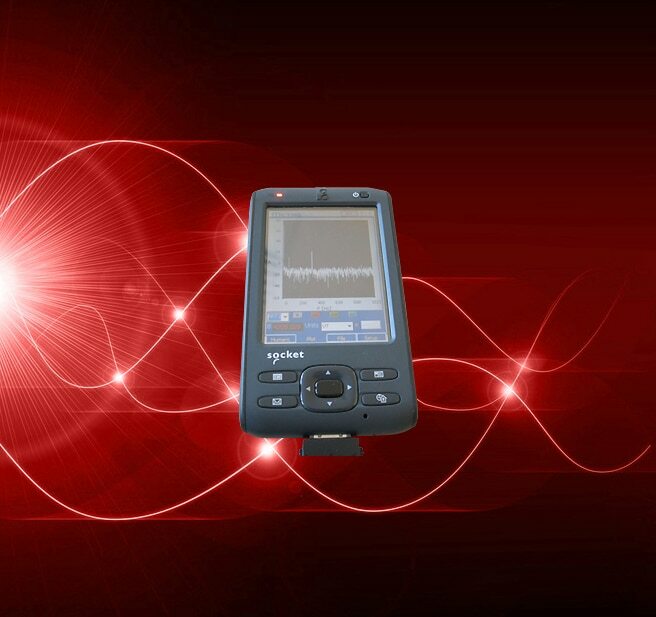 in the world to perform a direct spectral analysis of magnetic fields, from a few µT to 20T". These functions are the result of a whole series of improvements that have transformed the instrument’s firmware and software. Sampling is three times faster! As far as the firmware is concerned, the main improvement has been to increase the sample rate from 2 to 6 kSPS (kilosamples par second) where each sample includes all three axes. "With this sampleThe NMR sample is the material placed in the magnetic field, whose proton spin resonates when an RF field of... rate, the Nyquist barrier has been pushed back to 3 kHz, allowing us to reconstruct signals well beyond the 1 kHz bandwidth limit", Philip Keller points out. Along the way, the acquisition memory was doubled to 4 kS, so that the instrument can store roughly a second’s worth of measurements even at high sampleThe NMR sample is the material placed in the magnetic field, whose proton spin resonates when an RF field of... rates. The sampleThe NMR sample is the material placed in the magnetic field, whose proton spin resonates when an RF field of... rate when reading out data continuously via USB has also been raised, from 2 to 2.4 kSPS. A major effort also went into controlling the jitter of the acquisition timing: "In the first version of the instrument, we had an RMS timing error of ±20 µs, producing noise that was incompatible with any in-depth spectral analysis. It was far from easy, and we had to use a bit of ingenuity, but we have managed to reduce this error by a factor of 100! ", says Philip Keller with a smile. Not to mention a host of other "minor" improvements: data averaging and data compression in the firmware in order to use less USB bus bandwidth; a warning message indicating a timer overrun during rapid sampling operations, and auto-ranging in all trigger modes. Of course, the graphical user interface had to be overhauled to include the spectral analysis features. "At the same time, we redesigned the software to make the instrument even simpler to use", adds Philip Keller. Three new display modes are offered: spectrum (FFT), standard deviation and peak-to-peak (P-P). "Don’t worry, it is still possible to display raw data! ", says Philip Keller. In FFT mode, users can graphically display the full spectrum, or numerically consult the frequency and amplitude of specific peaks. Another new feature is the vector display, which makes it easy to orient the probeThe actual sensor that is placed in the magnetic field. The NMR probe contains the NMR sample; the Hall probe... along the field vector, like a 3D compass, to physically visualise the field. And there are several other innovations: full-screen display on the PDA, settings saved automatically when the program is shut down, optimised USB communication... and a help menu – just in case. All these firmware and software updates will be available in early 2012. They are compatible with all THM1176s already sold and can be downloaded free of charge. In finishing, it should be pointed out that the Metrolab team is also continuing to expand its rangeThe range of a probe is defined by the minimum and maximum field strength it can measure. On an instrument,... of probes: after the High-Field, High-Field Compact and Low-Field probes, efforts are now focused on developing a fluxgate probe and low-cost as well as high-resolution medium-field versions. All of which means you will be able to use your spectrometer just about anywhere!